Amazing, Spectacular, and even quite Sensational. Spider-man is easily one of my favorite characters of all time. While the webslinger has had several games across multiple platforms dating all the way back to the Atari 2600, the amount of games that have been well received can be counted on a single hand. When the surprise announcement came that Insomniac, developers of the Ratchet and Clank series was working on a brand new Spider-Man title, the hype was incredibly real and it became one of the most anticipated games in recent memory. Thankfully, all that hype was justified and not only is Spider-Man a true marvel, but it is also one of the best superhero games of all time. With each iteration of Spider-Man, each creator has put their own spin on the character while also remaining faithful to his roots. I’m personally a huge fan of what Dan Slott and Brian Michael Bendis have done over the many years writing the character and in the case of Bendis, creating a whole new dynamic with the Ultimate Spider-Man series. While some adaptations are certainly better than others, each have written Spider-Man as a man who will always sacrifice everything in order to help others. What Insomniac has done here can easily be interpreted as a passion project of people who fully understand the character and just want to tell the best story possible. Marvel’s Spider-Man, among its action spectacle, tells a very personal story for Peter, and while I can’t dive too much into explaining certain aspects as to why, it is one that is very heartfelt and emotional. When a series of attacks start occurring all across New York City, Spider-Man encounters a gang of mask wearing criminals called Demons, led by Mr Negative. While Mr Negative is at the forefront as one of the central villains here, Insomniac previously hinted that he is not the main villain of the game and that one more character that has not been shown off would end up taking that title. This character is wonderfully used and is present enough where you start to see the seeds of what their involvement will be further down the road. While it was predictable where it was going to go, the ride was nonetheless thrilling. The story allows for several moments of playing as not just Peter Parker himself, but as a few other characters as well, allowing them to feel far more involved in the story. These segments are mostly just stealth missions that are enjoyable but rarely stand out apart from the context of the mission. Given the nature of how open world games work, the pacing of the game is entirely up to you whether or not you’ll take part in a quest here and there between the main story missions. That being said, there is some small pacing issues towards the middle of the story that is noticeable, but it then kicks it into high gear until the credits roll, of which there are two bonus scenes to stay put for. Through this journey you will encounter a wide range of Spider-Man supporting characters like Aunt May, Mary Jane, Norman Osborn, Miles Morales, to a lesser known character like Yuri Watanabe. While they are present in voice only, you also have mention of Harry Osborn, Felicia Hardy AKA Black Cat, and J Jonah Jameson, with the latter being a radio talk show host whose broadcasts will pop up after certain events have transpired in the game. I was pleasantly surprised at how each character was utilized and felt worthwhile to be there. Yuri’s interactions with Spider-Man were always genuine (which is helped by the fact that the two actors are actually married in real life), Mary Jane’s very real approach to not wanting to be the damsel in distress, and how they integrated in the Miles Morales character considering he is without any spider powers. Apart from NPC’s and single mission characters, each of the supporting cast here is well thought out and fits a purpose in the narrative. Peter himself is as classic as we all love him to be. He is more or less penniless and always on the verge of being evicted by his landlord. He is struggling to make ends meet and in this world he has been Spider-Man for nearly a decade. We meet Peter after he and Mary Jane have not generally been on speaking terms for quite some time and their reconciliation feels as natural and as awkward as it needs to be. Not only is the writing absolutely superb between the two, but the performances of Yuri Lowenthal (Peter), and Laura Bailey (Mary Jane) completely sell these two former love birds. Whether it is the pair trying to piece together a current mystery or attempting to enjoy a home cooked meal, I truly looked forward to more situations that put these two together. With a character that has been around for as long as Spider-Man has, especially one that was present during the rise in early popularity of comics books in general, Spidey has collected himself a massive rogue’s gallery of very iconic villains. Shocker, Scorpion, Rhino, Vulture, and more show up in various circumstances and each are given a fairly enjoyable, albeit brief, boss encounter. As the game tends to focus on only a few major bad guys through its fairly lengthy campaign, the smaller villains that I’ve mentioned, as well as one that is easily miss-able should you not take in a few side missions, are not quite given a lot to do. The big scene shown off at E3 with Spidey being assaulted by the entire gang is a powerful and well directed scene that frankly should have not been shown. Being aware of this scene did make it less impactful, but it stills shines as one of the best moments in the game. These versions of Spider-Man’s villains are fairly standard when compared to how we know them in the comics books and even how they are portrayed in different games. As much as I would love to talk more about how Insomniac changed up a few key characters, well, that dives full into spoiler territory, but let’s just say that they change up the origins of one certain character in a very big way. Insomniac has crafted a breathtaking open world with their version of New York City, giving players a vast number of activities to keep busy well past the final credits. Granted, not all of the activities are exciting or work towards the fantasy of being Spider-Man, but the traversal mechanics and combat systems at least allow each of those activities to remain engaging. While I still have a few criminal bases to take down and landmarks to photograph, I’ve tackled each and every backpack, radio tower, Eco-station, and Black Cat collectible, even if I found the process a tiny bit tedious and formulaic. Combine that with numerous challenge modes and content-packed side quests, and you have the most feature rich Spider-Man game ever created. That being said, there are some puzzles attached to some missions and a few side quests, like trying to reverse trace a villain through their tracker, that fail at being fun what-so-ever. These puzzles come in a few forms; matching up tiles to identify certain chemicals or placing down power regulators in order to run an electrical current. Thankfully, these puzzles can be skipped should you want to with very little to no consequences for doing so. Web swinging around New York City has been one of the most talked about features ever since the first open-world Spider-Man game. 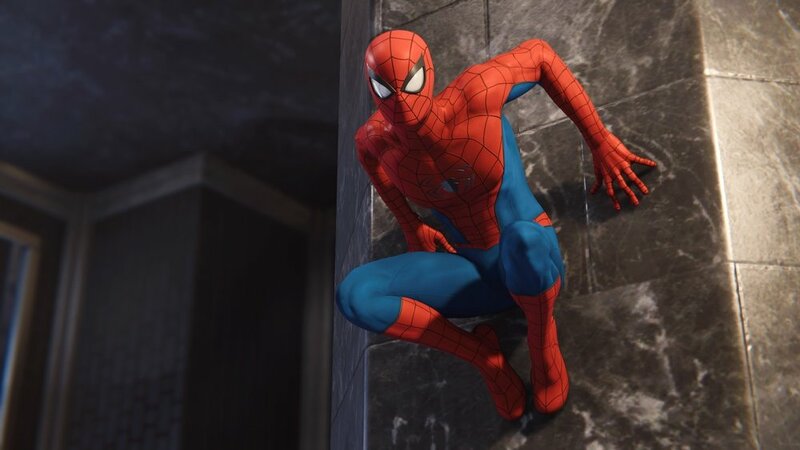 While each title has tackled the feat in their own special way, Insomniac pulls much inspiration from the 2004 classic, Spider-Man 2. Each shot of webbing from Spidey’s webshooters will attach to the side of a building to allow you to swing naturally around corners and build momentum. Combine that with a parkour system that will have you wall running and hoping over obstacles there is also the ability to dive to create a massive sense of speed into a last minute web swing. Eventually, you can learn tricks to not only add a sense of style to your commute, but you’ll earn small amounts of exp in the process. Insomniac has also added a web targeting mechanic that allows you to webzip directly to a ledge instead of over swinging the distance, which can still happen should you not use the prompts. However, what really sells the satisfaction of web swinging around the city is the stunning animations given to Spider-Man that change depending on the angle you are swinging at, the direction you are swinging towards, and the obstacles that are nearby. While some animations, like shooting through a crashing sign during a helicopter chase are scripted animations, there is always excitement based around what Spidey can do during his outings around the city once you upgrade certain web swinging mechanics via the skill points you earn. Web swinging has never been more enjoyable or as satisfying as what Insomniac has been able to do here and you can lose countless hours just traversing the city with no real intention of doing any missions or activities. Much like its fluid traversal system, combat has seen a major overhaul than what we’ve seen before while still feeling a bit familiar to previous Spider-Man games. While some may say it borrows from the Arkham series of Batman games, keep in mind that Spider-Man created much of that formula back in 2004. Spider-Man’s spidey-sense will warn you of incoming attacks and bullets and can assist in dodging away through a series of slick animations. Shielded enemies can be slid under between their legs and the vast assortment of web-tricks can have you bouncing around the battlefield racking up combo attack after combo attack web zipping to enemies and tossing them about. The environment can also be of use as you can shoot out webs to a variety of items to swing into enemies and this even works when they toss out grenades as well, returning them right back to sender. Much of the combat system is built around tapping or holding down the face buttons, giving a tremendous amount of depth around the use of just a few buttons. Spidey will also have access to a variety of gadgets like web-bombs, impact webs, electrical webbing, and more. While I found the radial wheel to be a less than stellar way to select these items, it still works and gives the wallcrawler a vast arsenal to use in combat. Unlike previous Spider-Man games, Spidey doesn’t have the ability to auto-heal during combat or pick up health tokens and this has been instead replaced with the focus system. You’ll earn focus as you dish out damage and pull off some sick combos and you can then use that saved up focus to heal by pressing down on the D-pad. Focus can also be used to trigger finishers that are pulled off with the triangle and circle buttons and can help you take out enemies that normally need a serious pounding. As you level up Spider-Man by earning experience through missions and various activities, you’ll earn skill points that can unlock new abilities like webbing away weapons, spinning enemies around, having attacks generate more focus, and far far more, giving you a massive amount of skills to unlock to tailor your Spidey to what you want from him. 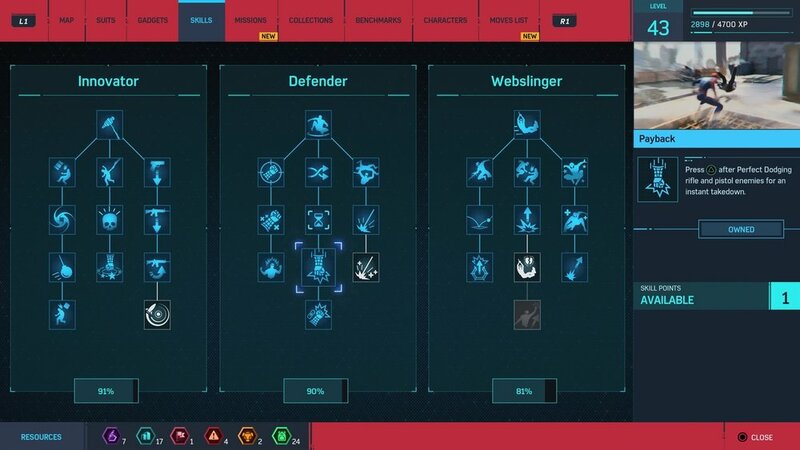 While you can initially work through the three skill tree’s to create somewhat of a build, it is very possible that by the time you finish the main story to have each and every skill unlocked. Alongside gadgets are the variety of different Spidey-suits. There are currently 27 costumes in the game that can be unlocked simply by playing the and collecting tokens. These tokens are earned by defeating criminal activities, challenges, and several other side content scattered all around New York City, giving each of these activities a greater importance than ever before. Each costume is equipped with a special ability like preventing reinforcements to arrive, earning focus faster, spawning decoys to trick enemies, or even making you fully bulletproof when triggered. What is especially cool about these powers is that they can be equipped to any additional suit should you want to mix and match. Spidey can also equip up to three additional mods like increasing the amount of health healed through focus, increase focus gain, or a general boost to exp earned through combat among the 24 total suit mods currently available. As was shown via the E3 gameplay trailer, QTE’s (Quick Time Events) are placed within a few of the action scenes like trying to stop a crashing helicopter or during several of the major boss encounters. While they don’t overstate their presence, you do have the ability to have them auto-complete as well as turning off or on several other accessibility options like tapping buttons instead of holding them, skipping the mini-game puzzles, and several other options for visually impaired gamers. PlayStation’s library of console exclusive games have more or less been some of the most visually impressive games every created and Spider-Man is certainly right up there alongside God of War, and Horizon Zero Dawn. Insomniac’s New York City is remarkably impressive, especially when it comes to small details like buildings having viewable rooms built behind the windows that are textured to make them appear furnished, an effort that most developers wouldn’t even bother with. One of the most staggering aspects of the clarity here is through the crisp detail in the textures of Spider-Man’s suit itself. The fabric detail is absolutely stunning and I would often switch costumes just to admire the detail. To further along just how visually pleasing the title is, the facial animations during conversations for each of the main characters really sells their dialogue and the emotions we are expected to get from them. When I had initially seen screenshots of Mary Jane, I wasn’t sold on her look. That all changed when she started talking and the small subtle changes in her expression really made me appreciate what Insomniac had done here. When Mary Jane and Peter are talking candidly, you can see just how much she misses him and what they had; which is a true testament to the passion behind this team. Swinging through the streets of New York and hearing people shouting “Hey! It’s Spider-Man” never loses its charm, but there is one aspect to the sound that I don’t think anyone saw coming. As Peter is web swinging around or casually walking down the street or perched atop a building, his dialogue was recorded twice in an effort to convey how he would sound during each action. As you are swinging around the city, his dialogue will sound winded or he will grunt a certain way indicating he is in motion or in combat. If you are standing still, then his dialogue is far more relaxed. To further make this system even more impressive, you can change up his movement between sentences and it will adapt and pull from each type of dialogue. It’s something that I hadn’t even noticed until several hours into the game. The wall crawler has certainly had his fair share of games and while some of them may have excelled in one aspect or another, Insomniac has crafted a title that succeeds across all aspects of game design. While the main campaign should take you roughly around 20 hours to roll credits, the content packed New York City will certainly keep you busy for long after. I still think that the secondary villains got the short end of the stick when compared to what Insomniac was able to do with the main ones, but it was still enjoyable to see so much of his rogue’s gallery used here with the inclusion of a few lesser known ones as well. Spider-Man is a character worthy of a solid video game adaptation and we finally got one that lives up to the hype. Marvel’s Spider-Man was purchased by the reviewer. All Screenshots were taken on an PlayStation 4 Pro.